Regrettably, gender equality is often seen as a women’s issue. The dominant notion seems to be that we should embrace equality for the sake of women, and that gender equality is a zero-sum game where women gain at men’s expense. In economic terms this is of course bogus; the labor market, for instance, is not a zero-sum game, and just as immigrants can fare well on the labor market without hurting natives so can women without making men worse off. The notion does not hold up in non-economic terms either. 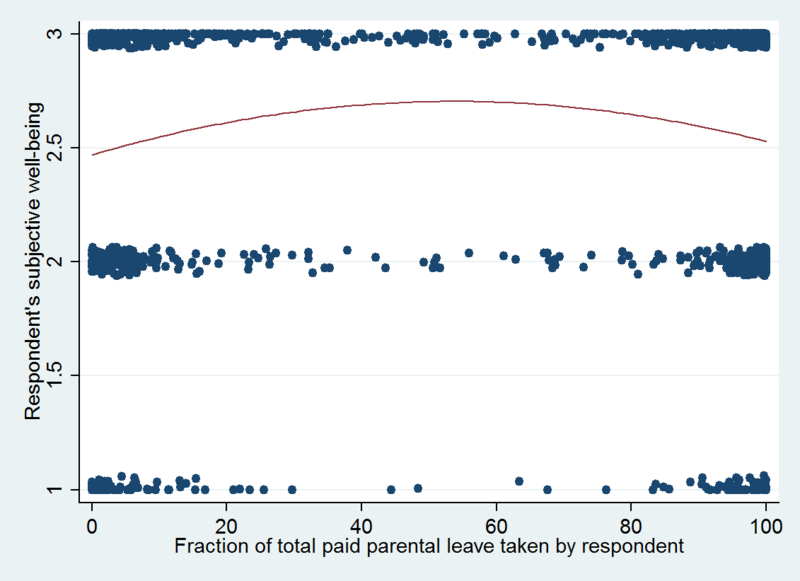 The following graph is an evaluation of about 5,000 Swedish parents’ level of happiness from 1990 to 2000 based on how they chose to divide the paid parental leave days that every parent is entitled to. What the inverted-U relationship in the chart shows is that parents who share paid parental leave days unequally (mothers take all the 480 paid parental leave days and fathers take 0 days, just to play by the stereotype), have on average lower levels of subjective well-being than parents who embrace gender equality. Gender equality is not only associated with higher wealth and economic growth (while controlling for other factors), but also with higher levels of happiness.